We are exporters from Taiwan making Weed Burner Torch. With its enormous trade knowledge and industrial experience, company has grown in leaps and bounds in the industry. Committed to our motto of "Quality, quantity & timely delivery", we are currently able to expand our wings to all parts around the World, in retail, hospitality & corporate sector. Enquiries from global wholesalers, distributors, buyers, agents and OEM/ODM are welcome. 1. Piezo-Igniting push to light flame. 2. Set-pin support to lit consistently. 4. Adjustable flame control via hand-wheel. 5. Ideal for lighting fireplace and charcoal, killing weeds, insect control, repairing the roof and melting iceeliminate weeds and pests. 6. 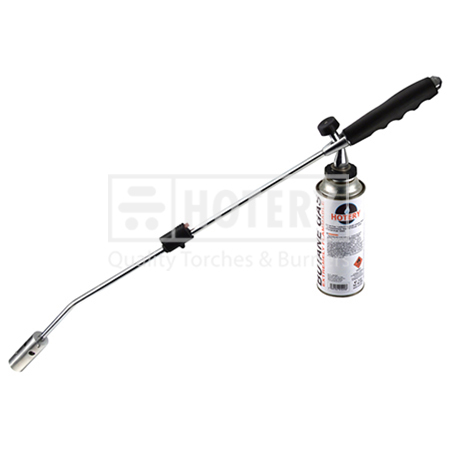 Perfect fit with bayonet type of portable stove gas canister.